While EVERYONE was gushing today about how X-President George H.W. 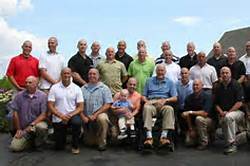 Bush shaved his head bald to honor a small child of one of his secret service members who had Leukemia— I was astounded to see all those guys standing behind him. No, ……I was—amazed and shocked that he needed all those guys in this picture to protect him. I always thought they got one or two for the rest of their lives, not 100. I tried in vain to find out just how many secret service are guarding our X- Presidents and kept coming up with the same answer: Most X Presidents have a total of 56 agents, but George Bush Jr. has 103. Come on. If you believe THIS, we are paying $2 trillion a month for these guys to live in grand style with no fear? One hundred agents a piece? Is it any WONDER we are going broke? They get 2 trillion a month and get assigned 100 secret service people each. They also get their kids to go to president schools like Adams family did and Bush. No wonder they spend billions to get into the White House. Please…somebody tell me this is NOT true. Awfully nice of King George to show compassion, but maybe the taxpayers should be asking…why don’t you show a little compassion to the taxpayers? Do you really need an army?